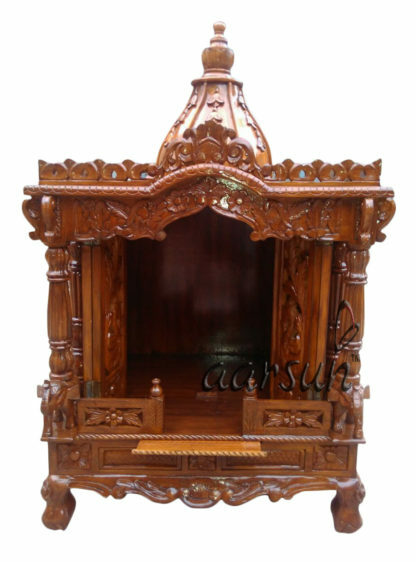 Aarsun Woods presents you Handcrafted Teak Wood Temple for Home and Offices.The Wooden temples are the most preferred among the masses over other Temples made in Marble or other materials. The Temple consists of a single Large Dome at the Top with floral carving to the ones at all corners of the Top part. The center or the Garbgriha is the place where idols / deities are placed for worshiping. Below that there are door at the front with peacock design. The pillars in front are supported by elephants in standing position. 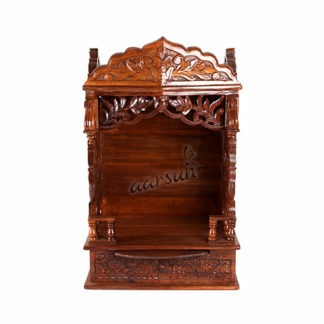 The base of the Teak Temple has one slider tray to keep all your pooja essentials at one place without any worries. The whole Wooden Temple resides on small legs designed in lion-leg shape. The design of the Temple resembles to the real Stone Temples built in the Mughal era. 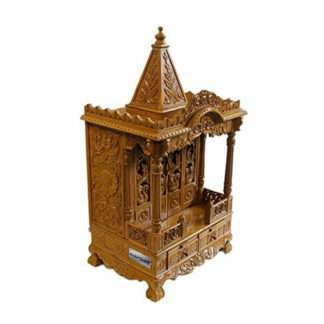 The Wooden Temple is handcrafted by skilled artisans from Saharanpur, India. Saharanpur is famous for its wood-craft all over the world as the carvings and designs are influenced by the Mughal Architecture popular for their clean carvings made manually using the good old tools. The Wooden Temples brings a sense of spiritual touch; bringing prosperity and peace to your home. Wooden temples can be of different size and design and one can also get one exactly as per their own design. Contact us at +91-8266888634 for details. Moisture Resistance: Teak Wood Temple has a good resistance to moisture and water.This is why it is the preferred wooden material used in Temple / Divine House / Pooja Room building for making the wooden flooring and decks. Because of this very quality, it is widely used to make Wooden Temples. Termite Resistance: Teak wood has a natural oil content that resists termites (white ants), fungal stains, and also repels other insects that can destroy . One who has ever had termites climbing on walls all over the house, and eating all the expensive wooden temple before, will readily vouch for how important this benefit is. 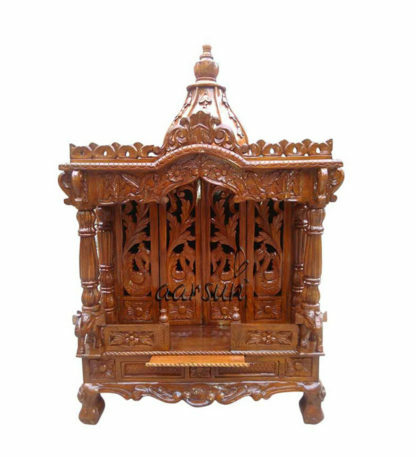 This termite and insect resisting quality in turn increases the life span of wooden mandir, and is the reason why Teak wood is superior compared to many other wood species in making wooden temple. 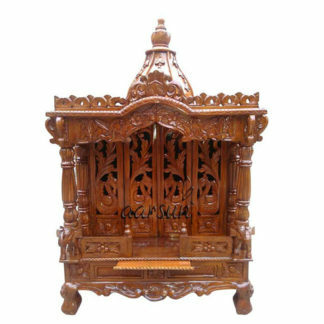 There are a number of designs available in Wooden Teak Wood Temple, we suggest you to have a look at Teak Wood Temple , also at Aarsun Handmade Teak Wood Temple / Mandir / Mantap. In case you are looking for Sheesham / Rosewood Temple , Traditionaly Designed Wooden Temple, also at Sheesham Wood Temple / Mandir by Aarsun.